Audio Research Reference 5 review | What Hi-Fi? The term ‘World's Best' is massively overused and abused. Even if it could be quantified, using such a term with pieces of hi-fi has little meaning. At the top-end of the market, levels of overall ability are very similar, leading any preference to be more about sonic flavour. What we can say is that, if you're in the market for a premier-league preamp, then Audio Research's Reference 5 has absolutely got to be on your shortlist, even if your budget extends far higher. That's not to say it's any paragon of perfection, mind. External build is solid, but in terms of sheer luxury and cosmetic detailing it's out-pointed by many a high-end rival, even those that cost vastly less. Don't get us wrong. This preamp feels like it'll give many years of use, and if it ever does go wrong you have the safety net of Audio Research's impressive track record of being able to service and maintain products decades after they go out of production. But, if you look at that hefty price tag, it's not hard to be disappointed by the poor feel of the rotary control knobs and the sheer cheapness of the front-panel plastic buttons. We're not big fans of the remote handset either, which may be nicely laid-out, but has no place alongside a product of this price. On a more positive note, the Reference 5's feature count is impressive. This is a line-level unit with six inputs, two outputs, each with a choice of balanced XLR or single-ended connections: you can switch between the two at the press of a button. set-up. 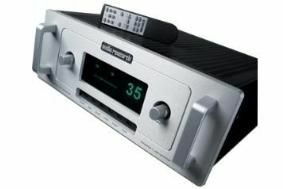 In short, this preamplifier is better connected than the royal family. The comically large size of the massive front display has split opinion in our office, but we all like the way it's easy to read from the other side of the room. If you don't like it you can always switch it off. We also like the fact that valve life can be monitored on an internal counter that measures hours of usage. On that note Audio Research claims the Ref 5 will sound best after about 600 hours of running. Valve life is claimed to be 4000 hours, which is not a lot if you keep the preamp powered-up all the time. Fortunately, warm-up is relatively rapid, so that's not needed for optimum performance. By normal standards the Reference 5 is a great-sounding product straight from the off. It delivers masses of detail, but manages to present it in a wholly natural and convincing manner. However, run the preamp over hundreds of hours and the sound steadily transforms into the realms of the magical. Any hint of harshness disappears and the sense of space and the sound stage in general expands exponentially with not a hint of compromise in precision or placement. Dynamics are conveyed wonderfully, with the preamp uncovering subtler graduations between extremes than any rival we've heard. At either extreme it impresses: dynamic peaks are defined superbly, with plenty of punch, while momentary excursions into quietness really do produce quiet. The latter is a difficult thing to do for all valve preamps, which invariably tend to produce more background hash than transistor-based alternatives. All this means challenging music such as Stravinsky's The Rite Of Spring, The Dark Knight OST or Massive Attack's Heligoland all come through with real presence, masses of impact and no shortage of excitement. You'd expect an astonishing level of detail on a preamp like this, and that's exactly what you get: at this price, that's the least that should be delivered. What's really pleasing is the way all this resolution is used to define the sonic textures of instruments and voices. The Reference 5 has the insight to distinguish between acoustic, harmonically rich instruments such as pianos, cymbals and drums better than anything else we've come across. When something sounds this informative, this convincing, even that five-figure price tag starts to make sense. Yes, we've been critical of certain aspects of the Reference 5's design and appearance, but we still think it's an utterly brilliant performer. If a certain degree of visual flair in keeping with the lofty price is important to you, you might be deterred. But those prepared to look beyond the unit's unpromising exterior are in for a sonic treat. Could it be the best preamp in the world? Possibly. Is it the best preamp we've ever heard? That's a definite and wholehearted, yes.